An endless supply of legal, copyright free music for every student in your school - created by the students right from a web browser. Musical training is not required to get started. A song can be created instantly and used immediately, or students can refine each block in the song. All music samples are created by Musicshake - students can use their songs in videos, presentations, blogs, or wherever they wish, worry free! $499 per year provides unlimited MP3s and WAVs for every student in your school. For most schools, it is less than One Dollar per student per year. 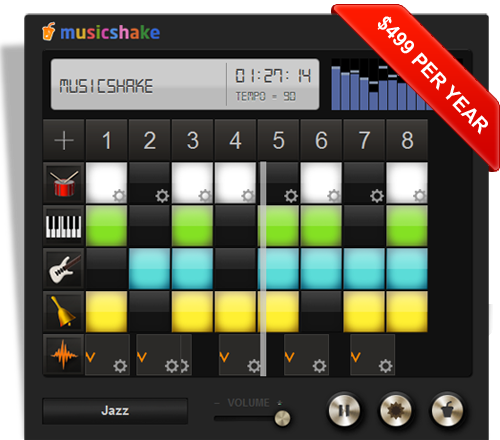 Spread the word about Musicshake Edu and start earning some extra cash right away. The whole process is very staight forward - complete a simple sign up form then create and share your referral codes. Every paid sign up using your referral code will receive a discount, and you get a commission for the sale.